How much will an MRI, CT, X-ray or Ultrasound cost? Patients are learning that they should price comparison shop for their healthcare expenditures, including studies such as MRI, CT (Cat) Scans, Ultrasounds, X-rays, etc. We proudly serve the residents of Asheville, Durham, Fayetteville, Henderson, Jacksonville and Southern Pines, and will provide estimates upon request. If your healthcare provider has written you an imaging referral for a diagnostic test, we will be happy to deliver a no-commitment price quote (no appointment necessary) based on your current insurance plan. Even if you don’t have insurance, our staff can quickly communicate the cost of your exam. To request an estimate at North Carolina Diagnostic Imaging, please complete the form below and click "Submit." A financial services representative will contact you to collect additional information and provide you with an estimate. Requests received before 4 p.m., Monday through Friday, will receive a same-day response. Requests received after 4 p.m., on weekends, or on holidays will receive a response the next business day. You have a choice, so compare the difference! 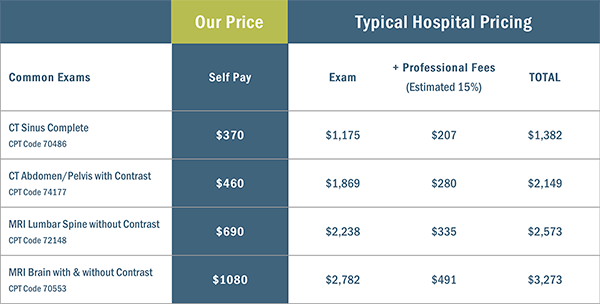 Not all imaging facilities are the same; price can vary greatly, even if you have insurance. If your doctor orders an MRI, CT, X-ray or Ultrasound, you have a choice where that test is performed. Choosing a non-hospital owned facility like North Carolina Diagnostic Imaging can save you hundreds or even thousands of dollars. Remember, when it comes to medical imaging, you do have a choice! For examples of our Self Pay Rates for selected procedures, see below (these rates assume payment in full at time of service). Click for a larger version of the following pricing table. Whether you're using insurance or paying on your own, make sure you call us for an accurate price quote at 855-663-9166. To help pay the out-of-pocket expenses that are due at the time of service, we are pleased to offer a variety of flexible and convenient payment solutions. We are dedicated to helping you through the billing process. Together, we can ensure that your experience is as easy as possible allowing you to focus on getting healthy. If you have questions related to your bill or insurance, please contact a patient account representative at 877-442-2988. Thank you for your interest in paying your bill with North Carolina Diagnostic Imaging. Multiple options make paying your bill quick and easy - select the one that works best for you. You can pay your bill right from your computer by visiting our secure Payment Pay Portal. Send a one-time payment or scheduled payments with a debit or credit card. Send a direct payment using your CareCredit healthcare credit card by visiting CareCredit's Pay My Provider Portal. Not a cardholder? Apply for CareCredit. Send a one-time payment or scheduled payments from the bank account you choose. Call Patient Account Services at (877) 442-2988 and we will assist you. Have your billing statement and payment method ready when you call us. Open MRI & Imaging of Asheville is conveniently located on Biltmore Avenue in Asheville, NC, just south of Mission Hospital. Offering MRI, CT, X-ray and Arthrograms, we have provided diagnostic imaging services to the community for over 20 years. Easy parking and hands on assistance from the moment our patients walk through the door are just a few of the advantages Open MRI & Imaging of Asheville offers. We know time is important to you so we offer same day appointments for most services as well as evening and weekend hours for MRI appointments. There is complimentary WiFi and coffee for your comfort and convenience. We can retrieve prior records for study comparisons from many hospitals in North Carolina and offer online results to your physician within 24 hours of your test. We utilize state-of-the-art equipment, including our new 3T GE Pioneer MRI. We offer two large bore MRIs for claustrophobic patients to help ease anxiety and complete the exam with ease. Open MRI & Imaging of Asheville is an ACR accredited facility and all exams are performed by a registered technologist. All images are read by a board-certified, fellowship-trained radiologist which is included in the cost of the study! The cost of our radiology exams are approximately 40-60% less than the hospitals. Our operations manager is Diane Miller and marketing manager is Justin Davis. We are devoted to community outreach and education to help those with imaging needs learn about our low rate offerings and speedy appointment availability. Our radiologists are all board-certified by the American Board of Radiology, which ensures that they have completed rigorous education and training standards. Many of our physicians are certified and fellowship trained in specialty areas, including breast imaging, cardiovascular imaging, computed tomography (CT), interventional radiology, magnetic resonance imaging (MRI), musculoskeletal, neuroradiology, neurointerventional, nuclear medicine and pediatric radiology. With more than a dozen highly skilled and experienced radiologists on staff, North Carolina Diagnostic Imaging offers patients and referring physicians in our region the best in medical imaging. With 36 radiologists and 7 mid-level practitioners on staff, our care givers have the credentials and experience to ensure you receive the highest quality imaging services. All of our radiologists are Board Certified.